Tyrone Opslag Unified Block series of products are high performance, simple, secure, scalable and affordable SAN storage system for enterprise and SMB. It is an ideal solution to the applications of mission critical data center, virtualization integration, media and entertainment, or large-scale surveillance; and also, backup and disaster recovery in enterprise, SMB or ROBO (Remote Office/Branch Office) deployments. The series features a wide range of form factors including a 24-bay, 4U 3.5” LFF chassis, 3U 16-bay, 2U 12-bay, and a 26-bay, 2U 2.5” SFF chassis. This allows more deployment flexibility to meet users’ budgets and rack density limitations. 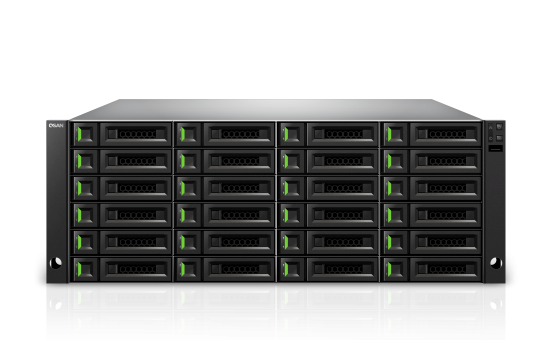 The advanced series is a proven high availability SAN storage system. All of the critical components are hot pluggable and designed with full redundancy. This design allows this series to withstand multiple component failures and achieve 99.999% availability.